The institutional identity of libraries – a theoretical framework; Traditional libraries and traditional librarians; New libraries and new librarians? Libraries (and society) go digital; Libraries, identity and change; Coda. Libraries and Identity summarizes the role of institutional identity in the emergence of new types of libraries such as joint-use libraries and digital libraries. 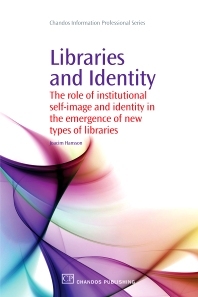 Professional and institutional identity has shown to be one of the most problematic, yet overlooked issues to deal with when traditional libraries such as public libraries and academic libraries develop into new shapes. The author clearly outlines the importance of identity in making change and innovation in libraries understandable. Based on original research the book comprehensively explores the role of identity as a trigger for change and development in libraries. Dr Joacim Hansson is Senior Lecturer at the department of Library and Information Science at the School of Humanities, Växjö University, Sweden. He has published extensively both in Swedish and internationally. Libraries and Identity is his fifth book.